← A Semi for the History Books: Big Upset at Briggs Cup! Thursday morning I woke up to the news that Trinity lost to Yale. Friday I woke up with a pain in my forehead as if a squash ball had pounded it all night, thanks to overdoing it at Tournament of Champions parties the night before. And Saturday and Sunday, I had to wake up early enough to get to my Grand Open Tournament matches. So I was very happy this past Monday, to wake up, go to work for half a day and then return to the glass court at Grand Central to watch the women play in their first round. It’s pretty quiet at noon on a Monday and while I loved the excitement and energy of the weekend, it’s quite nice to only have to focus on one thing—the squash in front of me, instead of in my head. It’s also great to focus on some truly great female squash players. First round matches can be both kinda boring and really exciting. The seeded players are saving themselves for the later rounds, and the qualifiers and lower ranked players are going all out to keep in it—if that makes any sense. I experienced something of the same over the weekend in the Grand Open. While I was knocked out of the main draw in the first round by the #1 seed in my division, I gave it everything I had in the consolation semis and won, barely, in five. Unfortunately, amateur players don’t have the luxury of 24 hours to recoup. I went back on in an hour. Don’t ask. But in round one of the the J.P. Morgan Tournament of Champions, everyone’s still fresh. Although nerves may be running a little high. One of my bleacher neighbors mentions that the women have much less experience playing on a glass court and with the bright lights and more reflective quality of the glass, it can be hard to always see the ball. Not to mention that glass plays differently; it’s both stickier and quicker. Players must alter their shots a bit, I suspect. I had asked a few friends which matches I shouldn’t miss and the one that comes up more than once is Donna Urquhart (AUS) vs. the qualifier Maria Toor Parkay (PAK). They aren’t on until later in afternoon though, and since I’m still a relative squash watching novice—especially of the women—I decide to see what things I can learn throughout the afternoon. 1. Nerves affect everyone. No matter how much better (on paper) you’re supposed to be. Sarah Kippax (ENG) who is World Number 16 appears less than relaxed in her first game against Miranda Rainieri (CAN) a qualifier and ranked a lot lower at 45. Kippax finally gets to match point and then just can’t put the ball away for the game. Rainieri ties it at 10 all and I realize that my fingertips are now sweating as I type my notes. I love and hate extra points. Kippax finally takes it after getting to and giving up match point more than I can keep track of. 2. Getting the last game gives you a leg up on the next. Kippax takes the next two games. 11-2. 11-5. 3. Being in great shape gives you two legs up. Natalie Grinham (NED) #2 seed may have had a baby 18 months ago and at 33 is one of the oldest players in the tournament, but her compact body looks lean and strong and like I wouldn’t want to mess with her even though I may be a head taller. I certainly wouldn’t want to mess with her on the squash court; her swing is both loose and controlled at the same time, and with racquet in hand it makes an awesome weapon. But a key part of her strategy seems to be to run her opponent Lucie Fialova (CZE) all over the court. And although Fialova is a mere twenty-three, she doesn’t look nearly as fit as Grinham and seems to be sucking air at times. Grinham gets the first game in 11-8, but then plows over her in the next two, 11-2, 11-5. 4. But sometimes being in great shape isn’t enough. A bleacher neighbor guesses that Samantha Teran (MEX) World Number 12 has lost about twenty lbs. since last season. She does look fantastic in her sleeveless dress; those are serious shoulder muscles. And she and her opponent Nour El Sherbini (EGY) ranked 28 are hitting much harder than anyone before them. El Sherbini doesn’t have the cut physique of Teran, but she has height, youth (16!! ), and a calm confidence. She has so many skills. Hits it super hard when she wants. Has clean closing shots—especially a beautiful backhand volley drop. And, perhaps most importantly, she keeps cool even when under pressure. Teran really makes her work and El Sherbini gets the first two 11-6,11-9, but then tins a usually perfect backhand to let Teran have the third at 9-11. She doesn’t let it get to her, however, and just dominates the T in the 4th game, only taking a step or a step and a half away from it, whereas Teran is dancing around it with many more steps. She may be fit, but she’s also using much more energy. If I were her, I would keep the ball away from El Sherbini’s backhand, but that’s easier typed than done, as El Sherbini’s reach is high and wide and she closes out the match 11-7 in the fourth. 5. Experience counts for a lot. While it’s exciting to see new blood pounding through the veins of impassioned young players, they often don’t have the composure that someone like El Sherbini appears to possess. Fellow countrywoman, Nour El Tayeb (#20) comes closest with her tough match-up against the lower ranked but greater experienced Latasha Khan (#26), and after losing the first two games with tentative defensive playing, she turns more aggressive in the third, taking the ball earlier and making more of her drops. But despite winning this game and the next, she still doesn’t look completely confidant and I’m sure Khan senses this. That, and she knows she has skills and strength to come back—which she does, pushing El Tayeb all over the court. 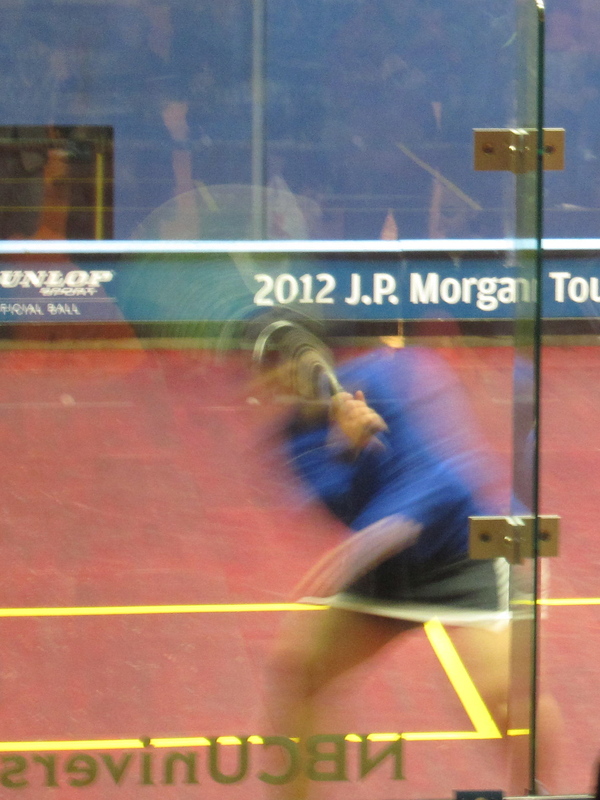 El Tayeb just cracks—or rather tins her way to a 1-11 loss, giving Khan the fifth game and a ticket to the quarters. Experience also counts in the match I’ve been waiting for, even if it’s only a few years worth. Maria Toor Pakay (PAK) has a back story that is impressive and inspiring, leaving Pakistan to train with Jonathan Power in Canada. She puts a lot of whole body power in her shots, but she can’t seem to find her game. Her shots aren’t as deep as they need to be or as tight to the wall, especially playing someone as sharp and focused as Donna Urquhart of Australia, ranked at 14. Urquhart is almost a head taller than Toor Pakay and with her reach and neat practiced shots, she forces Toor Pakay to rush her own shots, or at least that’s what it looks like. Later, I speak to Toor Pakay and clearly the glass court threw her and she just wasn’t able to adapt her game to it in time. But she quickly admits that she “wasn’t moving at all,” and just “banging the ball” instead of bringing it to the back of the court where she needed to. But while her eyes are filled with frustration, they’re also those of determination to do what she needs to do to come back better. 6. 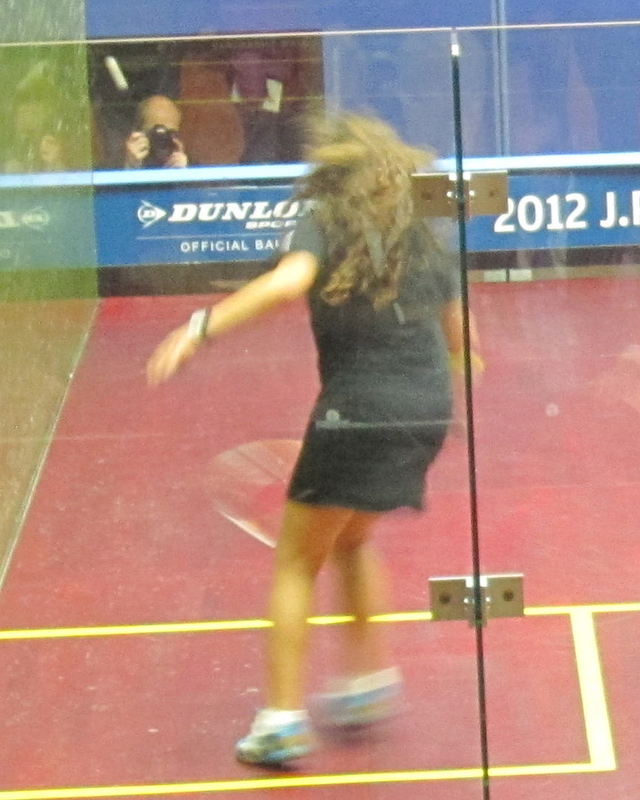 Curly hair makes you a better squash player. I wish . . . but when I first see the wild-maned Egyptian (#30) nail her first game 11-5 against Rachael Grinham, World Number 5 and the number one seed, it certainly seems true. El Defrawy is easily the most physical player out there on Monday—including the men, as well. She leaped. She dived. She slid all over the front of the court, almost getting the usher who mopped up after her following every slide, a standing ovation. 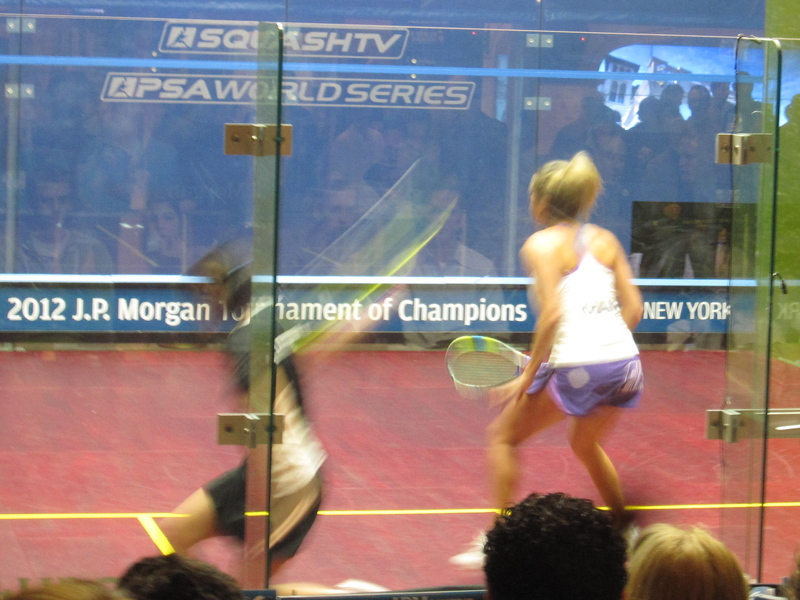 And her shots weren’t just physically impressive; she had beautiful drops, sweet nicks, and wicked cross-courts. While she isn’t as tall as Grinham, her leap forced Rachael to put her own cross court a bit higher, forcing it out of court once or twice. So impressive and sure of herself did El Defrawy look, that I was expecting an upset after she got the second game. Probably hoping for one. Nothing against Grinham, but when someone like El Defrawy performs, you want to keep watching. However it was Grinham who gave me my last pointer of the evening. 6. Don’t like the game you’re playing? Make up a new one. Grinham may not be nearly as showy as El Defrawy, but as another bleacher-mate commented, “Rachel is taking all the power away from her [El Defrawy]. She’s too smart.” And she was. Putting the ball higher, tighter, and into less predictable places. There was one boast that I had only seen (maybe) on a doubles court, it touched so many walls before dying in the back right corner. Grinham isn’t only smart, she’s damn creative. Admittedly, my eyes were too burned out by 8+ hours of squash watching to know exactly how she did it, but from two down, she squeaked back in the third for 11-9 and then didn’t even let El Defrawy get close in the last two. 11-3, 11-5. 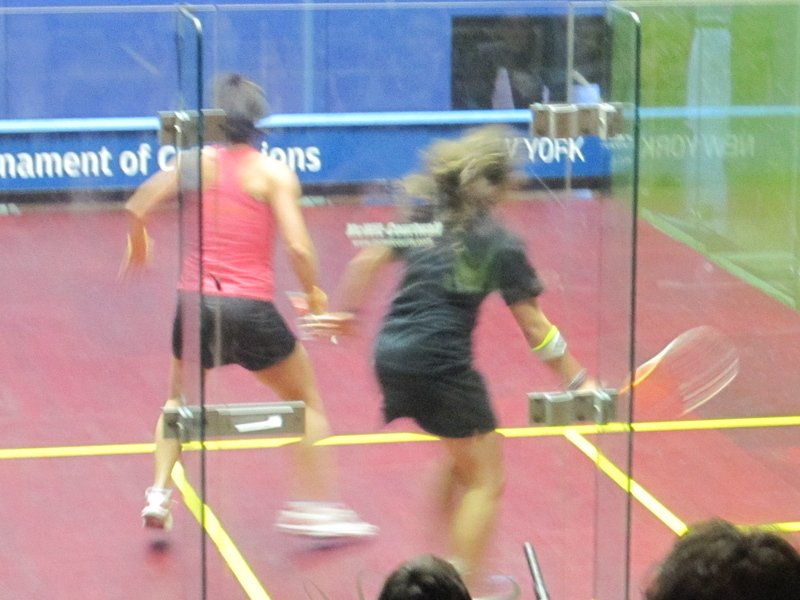 So that was my first round of squash lessons from the women’s pros in the ToC. And certainly not my last. Tune in tomorrow for my next lesson. Or, better yet, come yourself and learn from the women themselves. Round 2 begins at 12 noon. Ticket info. here and women’s draw info here. p.s. here’s my real last lesson of the evening, gleaned at 1:13 a.m.: Blue Point Toasted Lager goes really well with dark chocolate. Who knew? – all typos and errors will be corrected when I’m awake, hopefolly.